Let’s face it: life gives you plenty of reasons to get angry, sad, scared, and frustrated-and those feelings are okay. But sometimes it can feel like your emotions are taking over, spinning out of control with a mind of their own. To make matters worse, these overwhelming emotions might be interfering with school, causing trouble in your relationships, and preventing you from living a happier life. 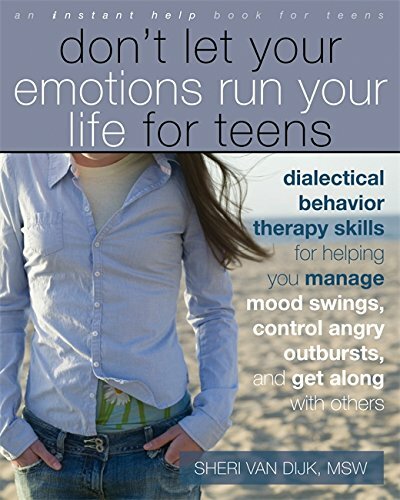 Don’t Let Your Emotions Run Your Life for Teens is a workbook that can help. In this book, you’ll find new ways of managing your feelings so that you’ll be ready to handle anything life sends your way. Based in dialectical behavior therapy (DBT), a type of therapy designed to help people who have a hard time handling their intense emotions, this workbook helps you learn the skills you need to ride the ups and downs of life with grace and confidence.